Has your odometer or trip odometer stopped working? Most speedometer gears fail because they were made with soft plastic that becomes brittle and decays with age. If you are comfortable with small mechanical repairs, you can save money and repair the odometer (mileage indicator) mechanism yourself with our replacement gears. 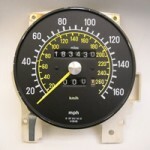 We stock gears for both mechanical speedometers and analog electronic speedometers. Our high quality gears are machined using a long-lasting, hard plastic and carry a LIFETIME LIMITED WARRANTY. NOTE: If both your speedometer and odometer don’t work, you may have a different problem. Visit our full website InstrumentClusters.com for details. If you are looking for transmission gears, try our friends at TCI Auto.